Connecting loads is the best way for you to save some money, and for us to reduce our carbon footprint and run more efficiently. Basically, we are often stuck shipping boats across country, from point A to point B, without a boat at point B looking to get back to point A. This means the truck and trailer will often run unloaded, compounding fuel and labor expenses. 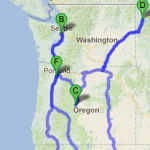 Connecting loads together to complete these return trips (to avoid what are commonly called deadheads) makes more sense for the clients, San Diego Boat Movers, our drivers and the planet. We’ve built these pages to allow you to sort through the various moves that are planned in the upcoming weeks and months. Identify a move that is ending in your area, and we can arrange to come pick up your boat at that time, taking you wherever you need to go. This can save you significant expense (30% is a good ballpark figure for savings), and makes us, and the other client, happy too. Sign up to be notified when we have an empty truck in your area. Save your clients MONEY!